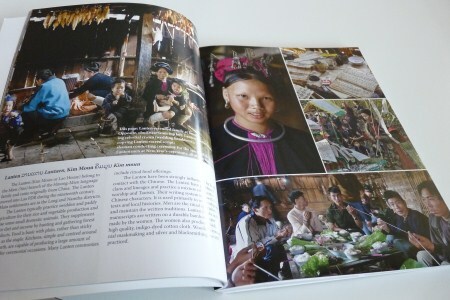 Remember my Christmas wish list with Food from Northern Laos: The Boat Landing Cookbook as one of the items on the list? Well, I finally received my very own copy a few days ago and very excited about trying out some of the recipes. For those of you that know me real well, you would recall the story of me packing up my suitcases with Kok and Sark (a mortar and pestle) to the Netherlands so I can have my favorite Lao dish, green papaya salad and other dishes abroad. Later, my mother shipped a sticky rice basket, and a set of sticky rice steamers via UPS to me so I can have my sticky rice to go with my Lao food. Through the internet, I later found out about The Boat Landing Guest House and Restaurant in Luang Namtha and was fascinated by their menu recipes. As a poor student living abroad, I was grateful for their online recipes as well as Lao recipes by Phia Sing at SEAsite. These recipes allowed me to be self sufficient when it comes to satisfying my craving for certain Lao dishes, the way my Mama or relatives back in Laos made it. I later expanded my Lao recipes collection. 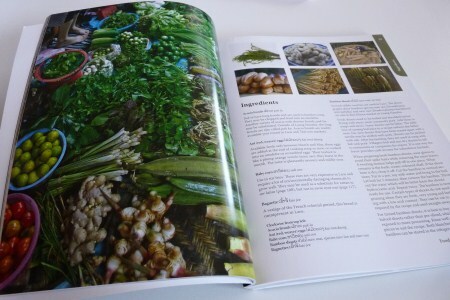 My first Lao Cookbook was no other than Taste of Laos. Later I added Simple Laotian Cooking, Healthy Lao Cuisine, Traditional Recipes of Laos, Fish and Fish Dishes of Laos, and Ant Egg Soup to my collection. When I found out about Food From Northern Laos: The Boat Landing Cookbook, I was more than thrilled and couldn’t hardly wait to add it to my still limited Lao Cookbook collection. At first impression, I can honestly state this cookbook is one of a kind with beautiful pictures in colors and of great looking dishes, showing real food, made in a typical village homes and at the Boat Landing Guest House and Restaurant. From examining the recipes and looking at the finished dishes, I know for sure that if I run into my kitchen and follow the instructions correctly, my dish is really going to look like what’s shown in the book. The author, Dorothy Culloty, has put forward great recipes that is easy to follow. You can be sure that she has cooked all these recipes many times before presenting the savory northern dishes to us. I found the personal touch, the great stories, and the amazing photography to be insightful and it brought me closer to the recipes. Dorothy introduces us to the people behind the Boat Landing Guest House and Restaurant and the culturally rich Luang Namtha. Her knowledge of the people and the food is extraordinary. The stories that Dorothy tells, the spectacular images captured by her husband (Kees Sprengers) and the recipes she includes in the cookbook make me want to take a trip to Luang Namtha. For those of us that were born abroad or grew up abroad and not knowing much Lao language, the list of ingredients in English/Lao along with photos will be very useful. You can’t take it for granted when your mother, father, or grandmother tells you to go get pak boulapha (sweet basil) and you know what it is in English and the other person only knows what it is in Lao, it can be quite frustrating in the kitchen. 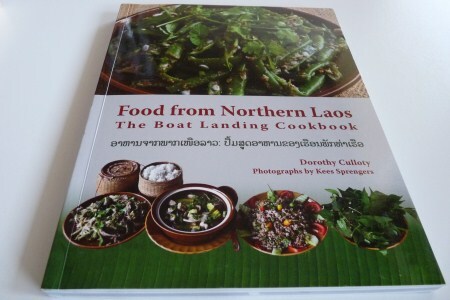 I can’t wait to cook from Food from Northern Laos: The Boat Landing Cookbook and I highly recommend this book. Who knows, after trying out some of her recipes, you just might be inspired enough to make your very own padek, using one of the three recipes or try them all! Thank you Darly for your kind words. We’d love to hear what you think when you’ve found an opportunity to cook a few of the dishes from the book. BTW, I like the re-design of your webste, it seems brighter and more open. You are much welcome. I will be posting the outcome of my cooking and planing on making one dish tomorrow. The old theme has been here for two years and I thought it’s time for a new look.